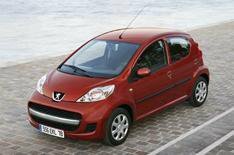 New Peugeot 107 revealed | What Car? This is the face-lifted Peugeot 107, which will go on sale early next year. The main change is to the 1.0-litre petrol engine. Refinements mean it now averages 62.8mpg up 2% from before. Carbon dioxide emissions are down to 106g/km from 109g/km, meaning the car will continue to cost 35 for VED road tax. Styling changes include a new front end, extra chrome detailing and a new wheel design. The interior also features better quality upholstery. No prices have been announced, but it is expected to cost from around 7000. The Citroen C1 and Toyota Aygo, which are built on the same platform as the 107, are also being face-lifted early next year.